To me, the world's best nut is the Hawaiian Macadamia Nut. This little round nut is not only delicious roasted, but also eaten raw. Here on Moloka'i, their are many macadamia nut trees growing. Occasionally you can buy them at our farmers market, but they are always available in our grocery stores. Unfortunately Hawaii can't claim the macadamia nut as their own. The first commercial orchard of macadamia trees was planted in Australia in the early 1880s by Rous Mill, in New South Wales. Macadamia seeds were first imported into Hawaii in 1882 by William H. Purvis, manager of the Pacific Sugar Mill at Kukuihaele on the Big Island, who used the trees as a windbreak in the sugar cane fields. By the 1920s, the macadamia nut was extensively planted as a commercial crop in Hawaii, and became well-known internationally. However, in 2006, macadamia production began to fall in Hawaii, due to lower prices from an over-supply. Outside of Hawaii and Australia, macadamia is also commercially produced in South Africa, Brazil, California, Costa Rica, Israel, Kenya, Bolivia, New Zealand, Colombia, Guatemala and Malawi. Australia is now the world's largest commercial producer – accounting for roughly 40 percent of the approximately 100,000 tons of seeds in shell per year produced globally. Compared to other common edible seeds such as almonds and cashews, macadamias are high in fat and low in protein. They have the highest amount of monounsaturated fats of any known seed and contain approximately 22% of omega-7 palmitoleic acid, which has biological effects similar to saturated fat. They also contain 9% protein, 9% carbohydrate, and 2% dietary fiber, as well ascalcium, phosphorus, potassium, sodium, selenium, iron, thiamine, riboflavin and niacin. In 2003 human nutrition research in Australia showed macadamia seeds lower total and LDL cholesterol levels. A note to fellow dog lovers: Nuts are one more "DO NOT EAT" item to add to your dogs list of toxic or harmful substances. Certain types of nuts like Macadamia nuts, walnuts, pecans, and pistachio nuts are toxic to dogs. It's best to keep all nuts away from Fido. Many consumers are unaware of the many and varied uses of the macadamia nut. 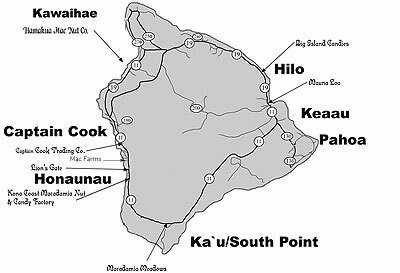 The Hawaii Macadamia Nut Association has developed a fun and educational, agritourism experience for visitors. Newcomers to Hawaii and seasoned visitors alike will enjoy experiencing the natural beauty of wandering through a macadamia nut orchard, then harvesting and shelling some nuts to sample. The Big Island, heart of Hawaii's budding diversified agriculture industry, produces 80% of the state's fruits, nuts and coffee. The Big Island is also the site of the world's first commercial macadamia plantations. Mini Mac Nut Trail: Includes two farms and a visit to processing plant or candy factory. Visitors will enjoy the ambiance of the lush macadamia nut farms. They will also see how the nuts are processed, visit a candy factory and get to taste the nuts along the trail. Full Mac Nut Trail: Four farm visits and processing plant or factory. Visitors may want to spread out their stops along the trail and stay overnight at a charming bed and breakfast on a mac nut farm. Be sure and visit Purdy's Macadamia Nut Farm if you are on the island of Moloka'i, a small and personal family style macadamia nut farm selling macadamia nuts as well as mac-nut honey. This is the real deal not a mega corporation tour. You get to walk among the trees, pick the nuts, learn how to crack the hardest of all nut shells with a hammer, and enjoy them. Contact: (808) 567-6601. Heat oven to 350˚F. Season pork tenderloin to taste with pepper. Place nuts in blender or food processor container. Cover and blend or process until crumbly, but not paste-like. Transfer mixture to an 18-inch-long piece of waxed paper. Stir in Parmesan cheese. Stir together egg and mustard in pie plate. Dip pork tenderloin in egg mixture; coat pork in nut mixture using waxed paper to firmly press nut mixture on pork. Heat oil in large, ovenproof skillet over medium-high heat. Add pork tenderloin and cook for 5 minutes or until surface is brown, turning tenderloin over halfway during cooking. (Tenderloin will not be completely cooked.) Roast pork tenderloin in ovenproof skillet in heated oven for 20-25 minutes or until internal temperature is 145˚F. Transfer tenderloin to cutting board. Loosely cover with foil; let rest for 5 to 10 minutes. To serve, cut pork tenderloin into 1/2 -inch-thick slices and serve with roasted potatoes and a nice green salad. Makes 4 servings. Sprinkle fish with salt and pepper. In a shallow bowl, whisk egg white until frothy. Dip fish in egg white, then coat with nuts. Gently pat nut mixture onto fish. In a large skillet, cook fish in oil over medium heat for about 6 minutes on each side being careful not to burn the nuts. Meanwhile, melt butter. Stir in parsley and lemon juice. Drizzle over fish. Serve with rice and snow peas. Makes 2 servings. Combine all dressing ingredients in a blender or food processor. Cover and process for 12 to 15 seconds until smooth. Refrigerate for up to 1-2 hours. Remove the top from the pineapple. Cut into quarters length-wise. Trim the peel and remove eyes and core. Cut into 1 x 2 inch pieces. Using a melon baller, cut balls from melons. Arrange all the fruit on lettuce, and serve with banana dressing. Or cube all and toss together, serve on individual lettuce lined plates, and top with dressing, top with crushed macadamia nuts. Makes 8 servings. This bundt cake is topped with fresh passion fruit syrup. In Hawaii, passion fruit is called Lilikoi. Pulse macadamia nuts in a food processor to make a fine meal but not into a paste. Add dry ingredients into food processor and pulse. Whisk eggs, oil and orange zest. Add to dry ingredients and mix well. Pour into well oiled bundt pan. Bake for 20-35 minutes at 375˚F or until a wooden pick inserted in the center of the cake comes out clean. Leave cake in pan to cool for 5-10min before turning it out. Make the syrup by incorporating the confectioners sugar, lilikoi pulp, orange juice and water in a small saucepan. Bring to boil, reduce and simmar until it reduces to a thin syrup (If the mixture is too dry add a few more teaspoons of water. If it's too wet or not sweet enough add 1-2 more teaspoons of confectioners sugar. You want a syrup that is sweet but tart. Pour syrup over cake and serve. You can also leave some syrup to serve on the side and it's also good with a bit of ice cream. Note: This is essentially a gluten-free cake if you omit the semolina and replace it with more polenta. Makes 1 bundt cake. Cream the butter until smooth and beat in the powdered sugar and vanilla. When the butter and sugar are combined, slowly add flour and beat until incorporated. Mix in the 1 cup of coarsely chopped macadamia nuts. Roll the dough into a log and cover with plastic wrap. Refrigerate for 2 hours. Heat oven to 300°F and remove dough from refrigerator. Slice the log into 1/4-1/2 inch slices. Place the slices on an ungreased baking sheet an inch apart and bake for 20 minutes or until the cookies turn golden around the edges. Remove from oven, and place cookies on a cooling rack. While cookies are cooling, melt the chocolate with the shortening, then dip each cookie halfway into the melted chocolate. Immediately sprinkle the top of the chocolate coated half of the cookie with the finely chopped macadamia nuts. Set cookies on parchment or wax paper, and let cool. Makes about 30 cookies. Spread coconut evenly over a buttered baking sheet. In a medium microwave-safe bowl, combine sugar and corn syrup. Microwave on high 4 minutes. Stir in nuts and microwave the mixture on high a minute at a time, stirring and checking after each minute for up to 5 minutes, until light brown, being careful not to burn the nuts. The mac nuts will be lightly browned and syrup will be very hot. Stir in butter and vanilla and return to microwave for 1 minute. Stir in baking soda until light and slightly foamy. Pour over coconut in pan. Let cool until firm, 1 hour. Break into pieces. Makes about 30 (2-inch) pieces.